Closings Down Year Over Year! For the first time since 2013 closed sales year over year have failed to match or beat the previous year. Inventory remains low which helps seller and mortgage rates, although expected to rise, are still historically low. The snowbird season is about to begin and the real estate market is still moving, despite the usual fall slowdown, made worse buy Hurricane Irma. The glut of condos in Miami-Dade county continue to be a problem for condo sellers as the inventory hovers around 9-10 months. That might lead to an opportunity for buyers to scoop up lower priced properties. 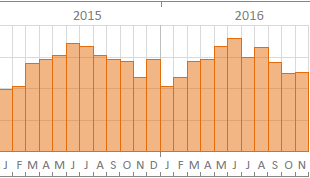 As you can see most months show a decline in the amount of closed sales year over year. 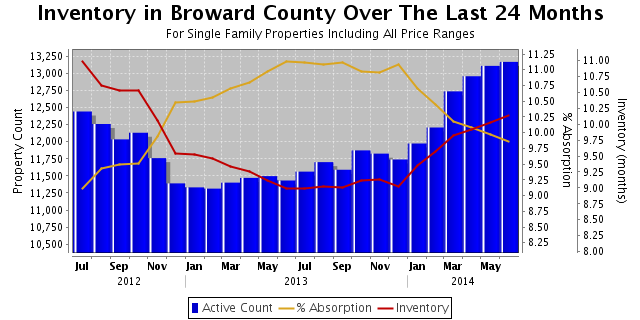 This indicates a slowing down of the real estate market in Broward County. 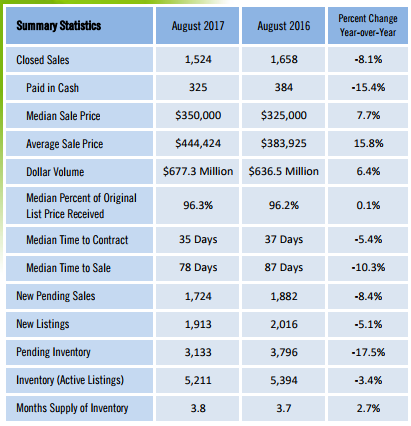 Inventory, however, remains low, which is why we are seeing an increase in the median sales price year over year, (as seen in the graph below). Looks like this is the first year since 2013 that closed homes sales have not increased year over year. 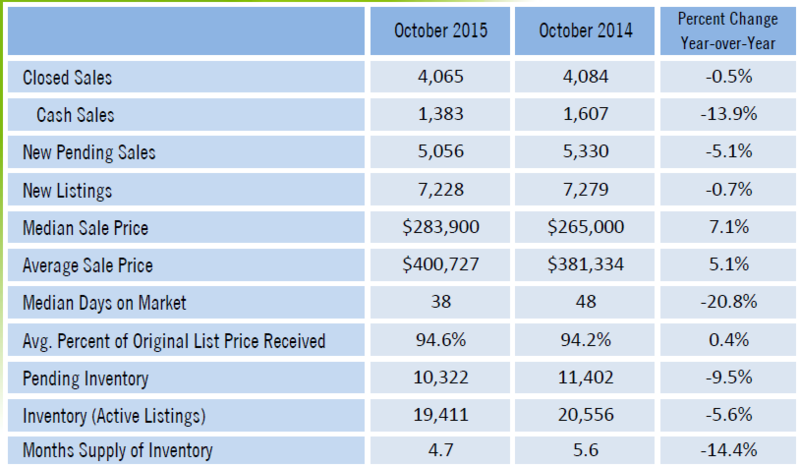 Months of supply of inventory indicates that we are still in a Seller's market. A normal market is considered around 5-6 months of inventory. Anything over that is considered a buyers market and anything less is considered a seller's market. The interest rate for jumbo loans – those greater than $421,100 – dropped five basis points last week, averaging 3.99 percent for the week. That is now 13 basis points lower than the conforming rate, which is the largest spread between jumbo rates and the conforming rate since March 2016, according to the Mortgage Bankers Association (MBA). 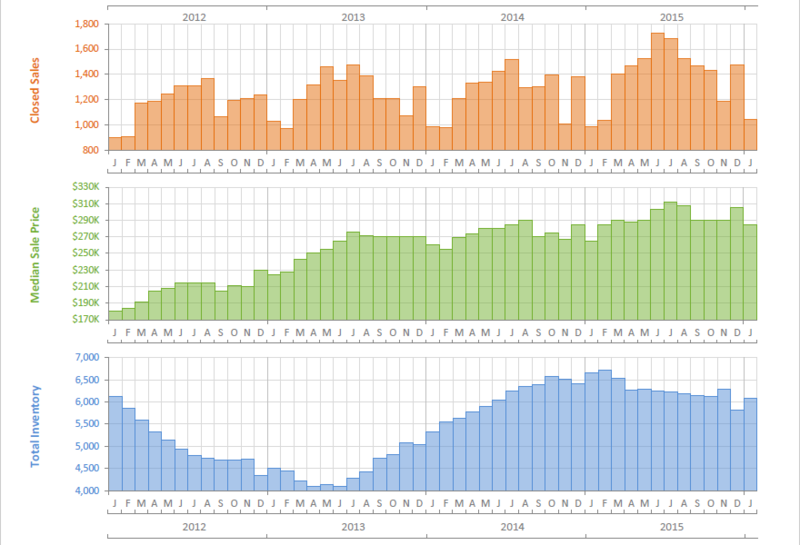 Above is the latest chart for closed sales in Broward County. This past January saw the least amount of closings in three years if not more. Already closing for March at our own title company are below what they were last year. Hopefully the number of closings will rise now that we are past the slowest time of the year, which is typically during the fall and winter months, as indicated above. Well it's that time of year, when buyers and sellers come out of the woodwork looking to start their home buying and/or selling process. Closings at our title company are better than last year, but still the slowest month since September. January, however, is typically the slowest month of the year, (see graph below). This is mostly due to the holidays, as people wait until the new year to get their real estate ball rolling. Hence the new home for sale in Parkland that I just listed. Not too mention the condo I just I went under contract on in Miami Beach. 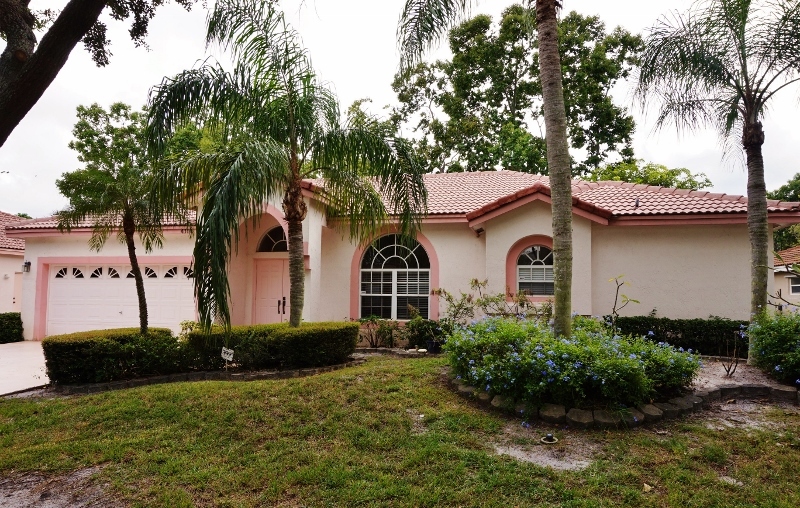 Also, I got a call from a couple looking to buy a home in Parkland, and finally I got a call from a good friend whose asked me to list his home for sale in Boca Raton. Overall this is a good sign for the real estate market and hopefully will continue. Lets start with the good news. Property values are up year over year, however bad news is Pending Sales are down. The market has slowed, which is typical for this time of year. In Parkland, Florida where I live, there has been over a 50% drop in sales from September (58) to October (26). If your house is still on the market, then you may now have to wait until January before buyers come back out of the woodwork. Good news for sellers is that inventory is low, even less than a year ago. Bad news for buyers, inventory is low, which usually keep prices up. More bad news for buyers and sellers, rising interest rates can spell trouble for home values and affordability, which ultimately can be good news for buyers as property values may be effected downward due to said buyer's affordability. Bad news for sellers? You guessed it. Property values may come down due to the buyer's mortgage affordability, which reduces the seller's equity. More bad news, rising interest rates will also affect credit card payments and other lines of credit. 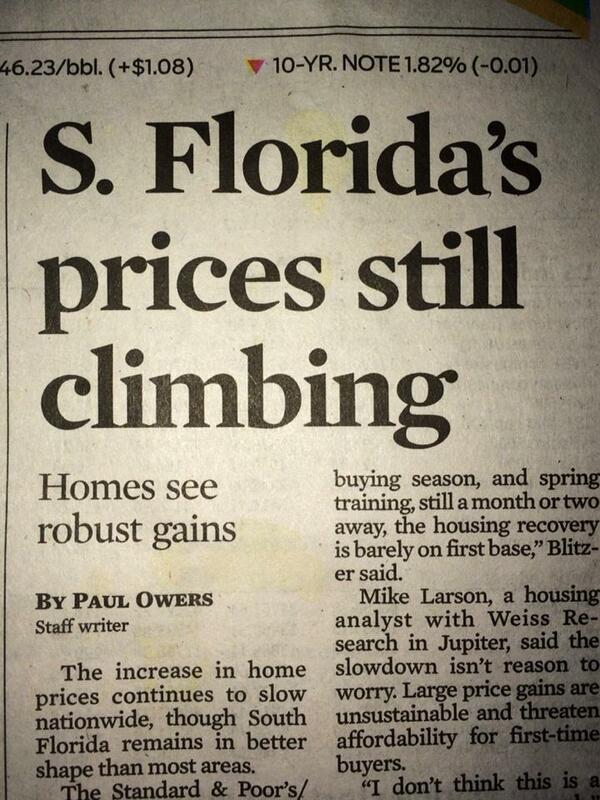 That's bad news for all of us as the cost of living increases. Rising interest rates may also slow the recent refinance market, which is especially bad new for my title company, A-1 Title & Escrow. Lastly, the good news is that Thanksgiving and the rest of the holidays are around the corner. Before you know it, it will be January, which is thawing season for the South Florida real estate market! Did you get all that? Have questions? Then call me, Aaron Glassman, at 954.326.2663 for answers! Now that fall has begun and the summer selling season is behind us, what happens next? How is the real estate market effected by the kids going back to school? To figure this out we can go back to the basics and the fundamentals of real estate. Simply put we can look at the numbers, especially inventory and mortgage rates. Yes, it’s true the activity tends to slow down this time of year, but so does the amount of new homes listed for sale on the MLS. Currently inventory for single family homes is lower than 5 months, which typically indicates a seller’s market. Another important number to look at is, of course, interest rates. With rates still historically low, this gives buyers more purchasing power and in turn drives homes prices higher. A lot too depends on price point. Some areas of the market, especially homes $500,000 and under, are moving rather quickly, as opposed to the higher priced market where homes tend to sit a little longer. So to me, the big question is what will happen to interest rates? This is probably the most difficult variable to predict. The market goes up and down based on the time of year, so that’s much easier to figure out, however, no one knows what to expect from the federal government. I’ve heard predictions ranging from the fed eventually raising rates to protect against inflation, to the fed preparing for negative interest rates in the future. I’m confident the election will have something to do with which direction we’ll go but good luck trying to predict that. So for now, we’ll’ just go with what we know. We know that the market has been climbing for the past 5 years, since 2011, which turned out to be the bottom of the market. Market cycles typically fluctuate every seven years. We also know that the market crashed in 2008. So then if we know these things, we can safely say that the current cycle is anywhere from 5-8 years old. Which basically means that the market may be topping out. Hopefully home values won’t come crashing down, but rather come in for a safe landing instead. What you need to think about as a seller, is where does the market typically go from here. If, typically, prices fall this time of year, then don’t list your house for sale expecting them to rise. Unless your house is in excellent condition, with updated baths and kitchen, you should expect to be on the bottom end of the pricing spectrum. The better the condition the quicker the sale. If your home is not updated, then setting the right price is key. Read my blog below, “Tale of Two Markets”, for more info on this. Now, looking ahead at the market that’s not part of the cyclical trend, we also can see a few head winds on the horizon. We know that there is going to be a series of HELOC (Home Equity Line of Credit) loans coming due. This may put added financial stress on some borrowers to pay their revised mortgage payments, as those mortgages begin to reset. Usually the banks turn the equity line into a second mortgage with principle and interest payments amortized over ten years. This could hurt a lot of people, especially those who may have a high balance. Some banks, however, may demand payment in full. This could potentially be a big problem as borrowers who are still underwater may not have the money to pay the new bill outright. Moving on, we also know that there is a steady stream of foreclosures that slowly find their way on the market, mostly due to a backlog of shadow inventory out there waiting to be foreclosed, that still needs to be cleaned up and listed for sale. It seems, however that the banks have not flooded the market and hopefully they don’t plan on doing so. If they do decide to flood the market, then that too will have a softening effect of prices, as more inventory gives the buyer more homes to choose from. Which is good thing for first time home buyer's and real estate investors, too. Speaking of investors, closings for investment properties have also slowed, mostly due to rising homes prices. The higher the price of a potential investment property, the less return the investor makes. Seasoned investors can still find opportunities, but it’s not like there are a lot of easy to find properties out there right now. So with all that said, where do we go from here? Simply put, as long as home inventory and mortgage rates remain low, then we should stay on pace for home prices to gradually rise over time, depending on the time of year. Have questions? Call me direct at 954.326.2663. The graphs below are very interesting to me. They indicate that even though prices had a slight decline in the 1st quarter, the listing prices during the same time continued to rise. A homeowner who listed in the beginning of the spring may be wondering why their home is still on the market. Well, simply put, perhaps they are priced too high. Over the course of the year, values tend to slide a little, especially in the late part of the winter. Prices typically get a boost in the Summer months as activity picks up. I'm eager to see if this trend continues this year. 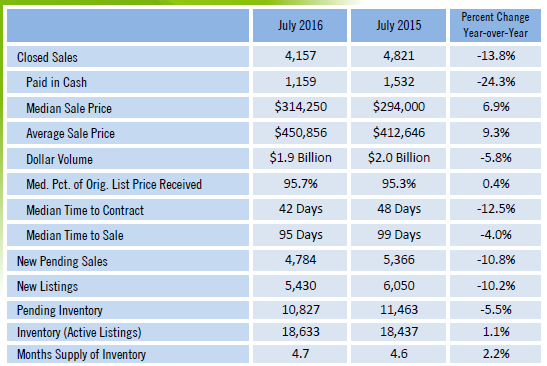 June's real estate stats will be a telling month for the market, and will help show where we go from here. Those numbers, however, don't come out for another few weeks. Given what I've seen in my own community, with prices dipping slightly, and a slower couple of months in our title company, A-1 Title & Escrow, I'm very curious how much higher prices go up from here. For sure they are up already beginning in the second quarter, as evidenced by the other charts further below, but will they surpass that of quarter's 3 and 4 of 2015, which so far is the highest values have gotten since the great recession of '08. Be sure to check back later this month or give us a call anytime to discuss your home's value, 954.326.2663. Interested in refinancing your home? Rates are have dropped since BREXIT and are still historically low. If you are considering refinancing, then be sure to call my wife Lisa at our title company, A-1 Title & Escrow, 866-303-2663 (AONE). She can put you in touch with one of our trusted lenders, as well as do the closing for you. Wow, lots to report! I'm not even talking about BREXIT, either. The 1st quarter saw the typical fall off, with regards to price and activity. As Yoda would say, "Always during the Winter, slow it is". March took off as per usual, but as you can see, activity has weakened a bit since then. I can attest personally as closings in our title company, A-1 Title & Escrow, have been off for the month of June. July, at this point is nothing to write home about, either. Although a mortgage broker just told me, wait for after July 4th. Let's hope he's right and the second half of Summer ends with a bang! 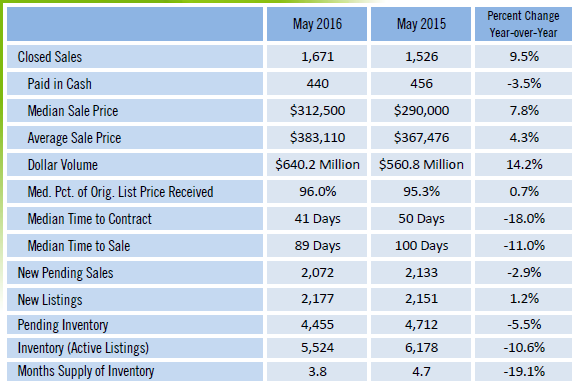 Below are several stats and graphs pertaining to the market, as of May 2016. One set is from the Greater Ft. Lauderdale of Realtors, and the other is from Realist, a real estate statistics and analytics company. Either way, the market is moving along the way it typically has since 2011. Each year the market goes through it's up's and down's, peaking at some point in the Summer and then trending downward until February. March is usually the beginning of the Spring season. Interesting to note, that each year the number of closings continue to out pace the previous year. Median prices continue to climb, as month's of inventory has decreased. On a side note, however, I recently did some research in my community of Cypresshead, in Parkland, FL. From what I saw, prices seemd to have decreased a little in the last six months, as most homes have sold in my community at around $200 as sq. foot or under. Aside from a couple, not many homes sold for more than that. Compare that to the end of 2015, when homes were selling anywhere from $210 t0 $260 as sq. foot. That's quite a change. But then again, we are talking about homes mostly above 550k - 1.6 million. 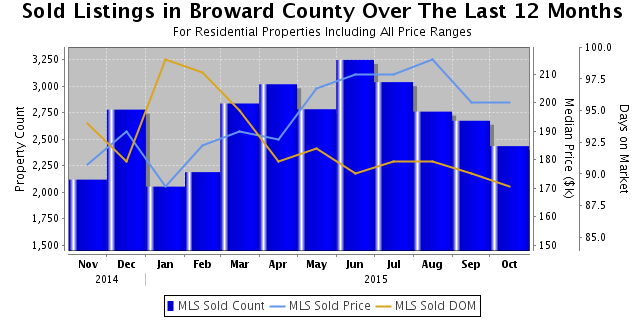 A much different market then the average sales price in Broward county, and one that may be slowing down. Have any questions? Don't hesitate to call Aaron at 954.326.2663 for more information on today's, South Florida real estate market. The above chart is through the first quarter only. As you can see in the 2nd set of graphs above (in green), the median sales prices has come up since the end of the 1st q. Yes, the Summer selling season is in full swing. Actually, the market took off in March, which is the typical start our cyclical real estate season. The single family and first time home buyer is alive and well. They are out and about looking for their new home with A rated schools. In Parkland, inventory is low and prices are high. 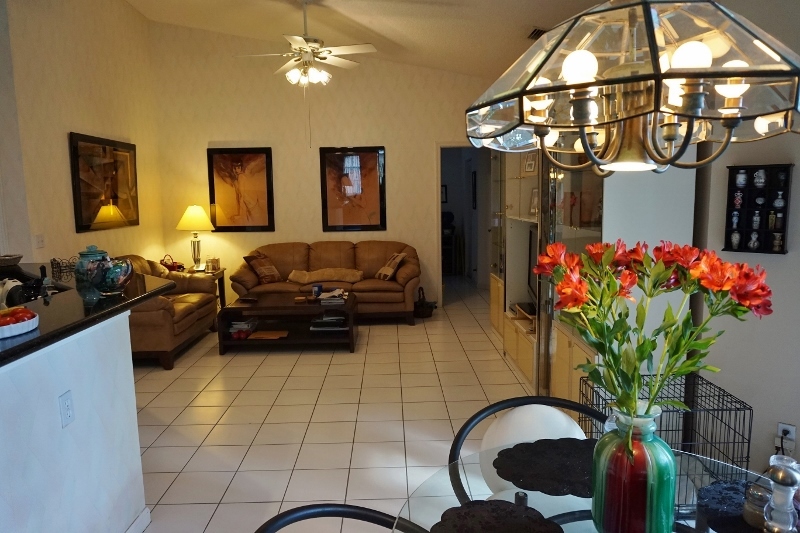 Where as in adjacent cities like Coral Springs and Boca Raton, there is lots to choose from and you can get more for your money, while still living in an A rated school district. However, the condo market has weakened, especially in Miami and along the beaches. Months of real estate inventory are on the rise, as foreign buyers have slowed their buying pace, due to economic conditions abroad and political uncertainty here at home. Can you say Brexit! Thinking about refinancing? Rates are still historically low and now is a good time. Home values are up, so good chance the equity in your house is, as well. We just re-financed ourselves, as the value of our home in Parkland is finally worth more than what I paid for it in 2004! Not too mention that we just saved $500 a month! If you are considering refinancing, then be sure to call my wife Lisa at our title company, A-1 Title & Escrow, 866-303-2663 (AONE). She can put you in touch with one of our trusted lenders, as well as do the closing for you. Moving forward into the Summer real estate season, I expect more of the same brisk pace that we have seen over the first three months of the season, especially in the single family home market. Looking at the charts below you can see how real estate sales trend upward from March through August. Based on this previous real estate activity, all signs point to more of the same. Let's hope so anyways! There are many great things about February, including of course my birthday! One of the things I like most, is that February goes by quickly. Typically for my business February is the end of Winter and the beginning of Spring. I say that because it's in March when we see the return of business in the real estate market. As you can see by the charts below, it's typically in January and February that there are the least amount of closings. The numbers for February are not out yet, but I'm willing to bet that the amount of closed sales will be low, similar to January's numbers. You practically can set your watch by it, really. 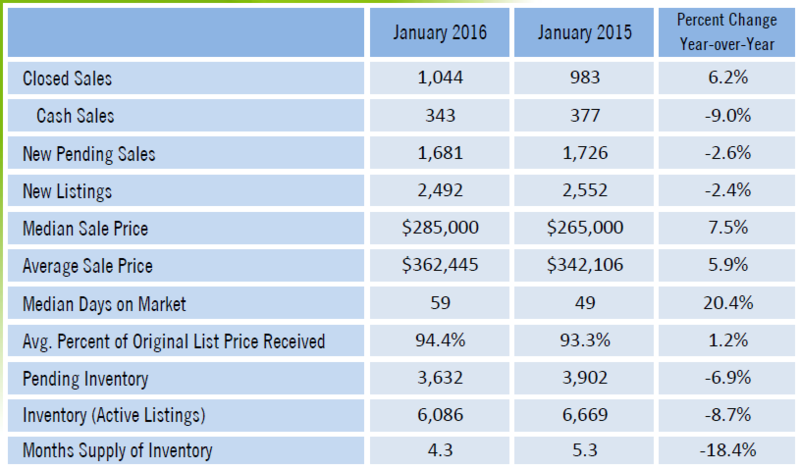 Take a close look at the number of closed sales in January and February from 2011 through 2016 and you'll see the cycle for yourself. So now the good news! As February fades away, Spring is, well, springing. New listings abound in my home community of Cypresshead, as well as around town. I've even taken three listings myself and am getting ready to list two more in the upcoming weeks. Prices have risen in some local markets, but overall they have leveled off since the late fall, which is also evidenced by the charts below. The decline in home values during the winter is pretty much normal and in line from year to year. If, however, things go the way they have for the past several years, we should see a rise in home prices through the summer selling months. Rates will have a lot to do with homes values, too. The higher rates go, the less people can afford, which usually translates into lower home values. A lot will depend on the U.S. economy and if investors believe they will find better returns in equities, which in turn creates less demand for the ten year bond, which long term interest rates are tied to. Of course the world economy will have a say, too. 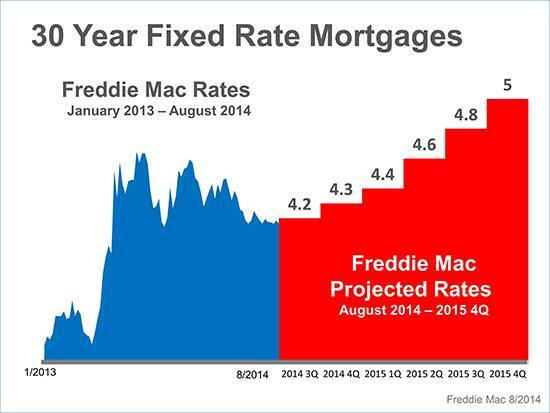 All I know is that my mortgage lender told me to lock my rate at 3.75% because the jobs report was due to come out. He just saved me $500+ a year, as rates spiked up the very next day. Are rising rates on the way. As my mortgage lender likes to say...I don't have a crystal ball. I'll tell you what I do know is coming, and that's the expiration of HELOCS that home owners took out over 10 years ago. Those lines of credit are coming due for a lot of people and will continue to do so for the next couple of years. Some of them require the borrower to pay over an amortized period of time, like ten years, others require the borrower to pay in full. This can be troublesome for some borrowers to pay back in either case, as the payment on such a loan can be in the thousand's of dollars. Hopefully with rising home values and household equity, those borrowers will be able to refinance their HELOC's. Otherwise, things could get dicey again. I also have noticed lots of foreclosures compared to the amount of short sales on the market. Still there are more traditional sales than either of the two distressed statuses. Although, it looks as if the shadow inventory is starting to hit the real estate market, or should I say continuing flow at a decent pace onto the MLS. Currently I have two Active listings. The first is a beautiful, fully updated 2/2 condo with a screened in patio and lush back yard, just steps away from the lake next to the building! The unit is in Meadowridge, which has lots of amenities, is conveniently located near major highways, shopping, dining, and with-in walking distance to Cidar Park. Visit DeerfieldCondoForSale.com for price, pictures and to watch the video tour. You can also click the My Listings tab at the top of the page and click on either listing to the left. The foreign dollar has softened demand for winter condos and second homes, especially on the beach, in areas frequented by our neighbors to the North and other European countries. Also, the warm weather up north this past winter has softened sales for snowbirds. Lastly the stock market correction at the beginning of the year slowed things down a bit too. I've, however, heard that we are due for more snowbirds coming down this month, and my recent visit to Wal-Mart in Hallandale Beach confirms it. Lots of Northern license plates! Also, since President's Day, it looks as if the stock market may finally be coming around. Hopefully that will make buyers feel more confident as the market returns back to normal. Again, spring has sprung and the busy summer selling season can be seen on the horizon. The charts indicate homes values should rise. 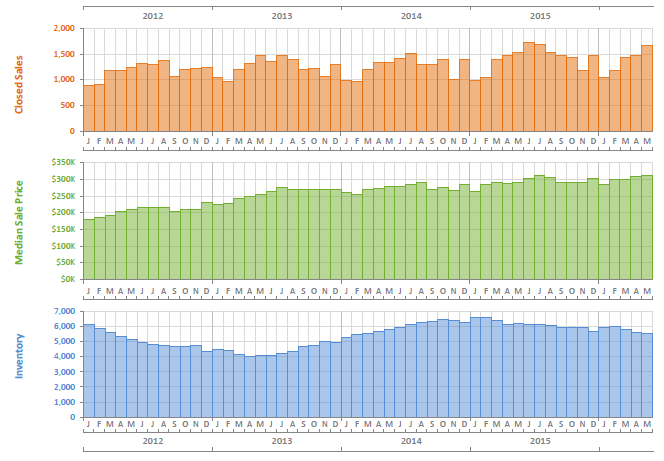 Inventory, overall, remains low at 4.3 months, which is tilts the power in favor of the seller. As the seasons change, so will the real estate market. Be sure to review the charts and graphs below and let me know what you predict. Call or text me at 954.326.2663. Thanks For Reading! Well, after an intense 4-5 weeks of new listings, pending contracts, networking and more, things have finally slowed down enough to write a blog post. So, is the market hot or not? Easy answer, yes and no. Warm weather up North, the stock market slump and the lower Canadian dollar have brought the Snowbird season down to it's knees. And that's the way it's been for the past four - five months. Not hot. Now, however, let's talk about the "Hot" Yes, since January, I have picked up several listings (one already under contract), have one buyer under contract, and am currently working with several others. Title closings for the end of February as well as March are looking up. It's almost as if you can set your watch by it. There, too, have been several new listings in my community and I expect to see more coming to the market very soon, as we get ready to ramp up for the Spring listing season. So, what does that mean? It means the future looks bright. With, however, more inventory, that means more competition from other seller's which may have an effect on home prices. With however, interest rates unexpectedly falling, the buyer has more purchasing power. This is turn usually helps prices increase. The market for the past 5 years has trended north, as indicated in the chart above. 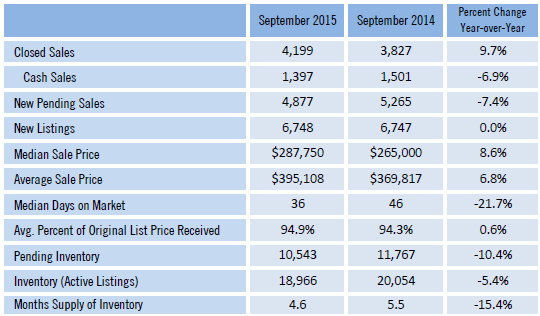 As inventory shrank, and rates remained low, prices increased. Inventory has climbed a bit, but until homes become more unaffordable, I don't see much of a slowdown when it comes to rising home values. Prices are just know coming back to where they were ten years ago, so there should be room to go. Also, as prices increase it should correlate to higher home equity, which will in turn allow for homeowners who have been waiting to sell to put their homes on the market. So let me say this to finish up. The season's are changing. What once was cold (Fall & Winter)is turning hot (Spring & Summer). That pretty much puts us at medium! Be sure to call anytime (954.326.2663) for more details about today's South Florida real estate market, and see below for more blog posts. Selling Real Estate in Parkland & Beyond Since 2004! 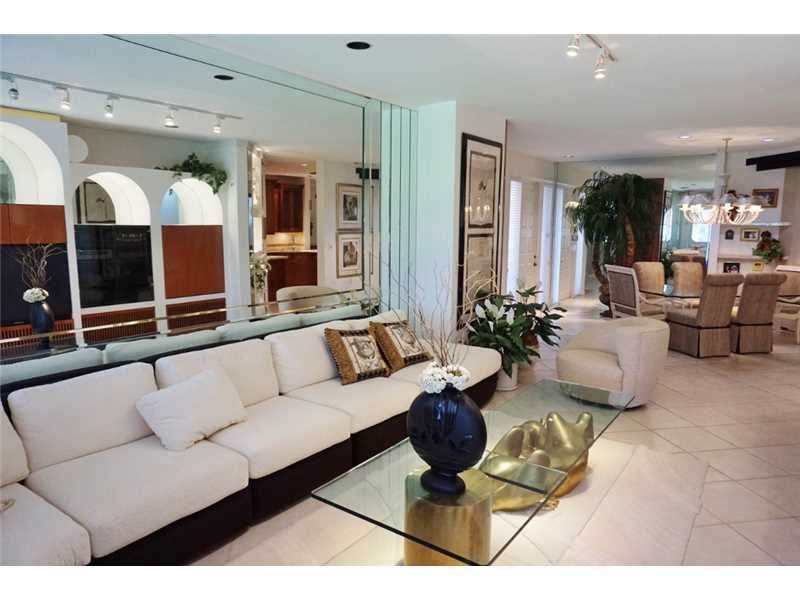 HALLANDALE BEACH CONDO FOR SALE! Below is a flyer for a new listing that has not yet been put on the MLS. It's a beautiful, charming and cozy condo! This unit has been remodeled with a new custom kitchen, updated bathrooms, new floors, extensive crown molding, wood blinds and so much more! Steps away from the pool and directly across the street from the beach, come see why this unit makes the perfect winter getaway for snowbirds, or simply a great place to call home! Yep, Still super busy. Three offers submitted, one new listing taken and one new listing on the way. The new year has brought new business, as the market has popped. Although while working with a buyer in Parkland recently we noticed that a lot of the current properties on the market have had their prices reduced several times without going under contract. That makes it a great time for buyer's to strike a good deal with seller's, who have been trying to sell over the past few months. Looking for a Realtor who knows the market? Call us now at 954.326.2663. We don't just help our clients buy and sell real estate, we help them CLOSE! CHICAGO – Jan. 5, 2016 – This year may have been the best for housing since 2007, but the market will likely get even rosier in 2016, according to a recent real estate forecast by realtor.com®. One of the main drivers behind the brighter 2016: The projection that employment will continue to grow, which will add to consumers' wallets and allow them to purchase their first home or upgrade to a new one. Well, although there has been some recent activity with snowbirds and such, December closings are down. In general the Fall season is one that, well, falls down. As compared to the Spring and Summer seasons, Fall tends to dip. You can see that indicated in the chart below. Now with rates scheduled to rise, it's my opinion that home values will slow, and/or at least remain flat for the next quarter. If you have not already done so, please be sure to check out other areas of my site. I'm always adding new information about the city of Parkland, as well as other important information that pertains to the general South Florida real estate market. Just recently I posted some Parkland news here:http://aaronglassman.com/parkland-news.asp I've also added some of the recent closed sales and links to helpful reports here:http://aaronglassman.com/parkland-home-sales.asp. One of the important things I noticed is that there were 30 closed sales in Parkland in the last 30 days. That's one sale per day. Which I think is a very active pace. 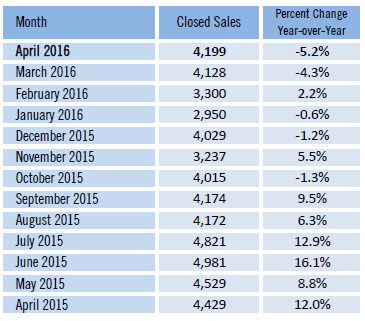 Below, too, is a recent chart of closed sales month by month for the past year. As typical, closing is the Fall are down as compared to the Summer, by 1,000 homes. Have questions? Call me at 954.326.2663. I have answers! 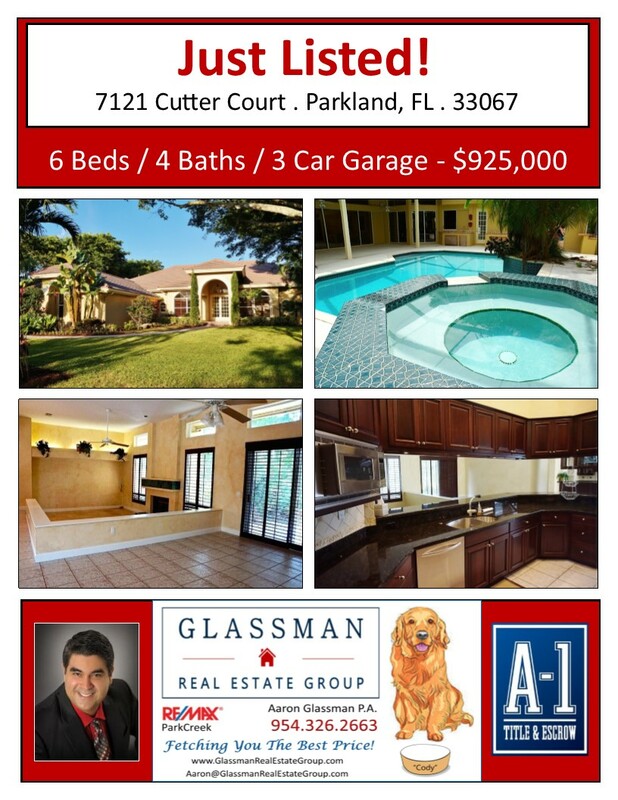 Glassman Real Estate Group - Selling Real Estate in Parkland and Beyond! Fall is in the air! The wind is blowing, the air is cooler, its a beautiful time to live in Parkland Florida. It seems like we wait all year for the weather to be like this. Now that we are past the release of the October numbers (see below for my take on that) let's move on my projection for November, which simply put, is up. The title company saw an increase in the amount of closings, while two of my Pending Sales closed this month! :) December's is anyone's guess, so I won't make one, but I will say that there is still time to add some more closings to the board and that's what I'm working towards. Call me now for a Realtor who knows how to sell homes for sale in Parkland and beyond, 954.326.2663. Glassman Real Estate Group . Selling Real Estate in Parkland and Beyond! 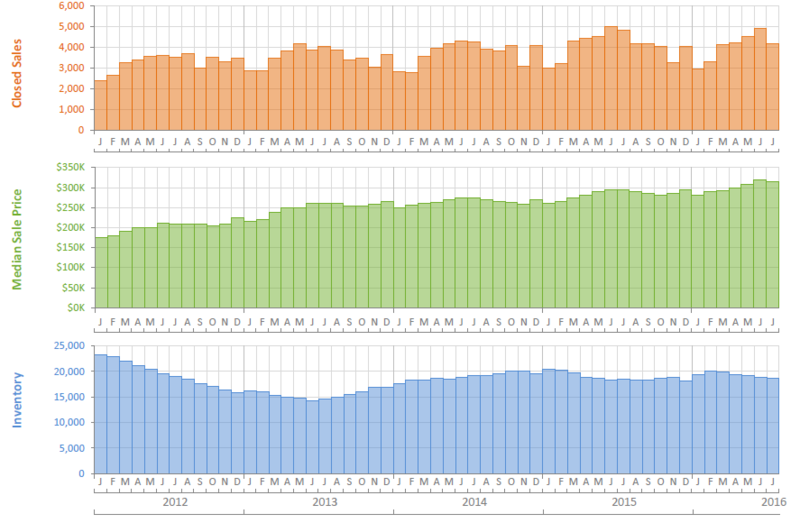 Below are a couple of charts indicating the number of closed sales of single family homes throughout Parkland and the South Florida real estate market. 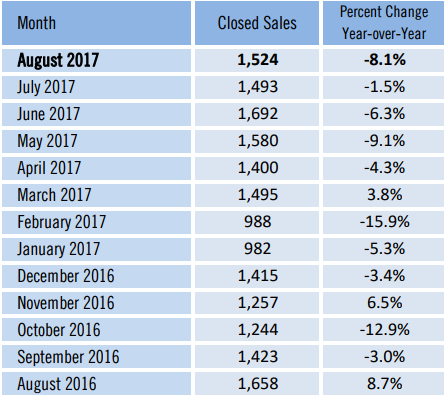 Although closings year over year have been increasing, you can see that the number of closings in October 2015 have fallen as compared to June of 2015. If Spring is the time for new listings and the Summer is the height of the selling season, then Fall is exactly that, the "Fall"of the market. 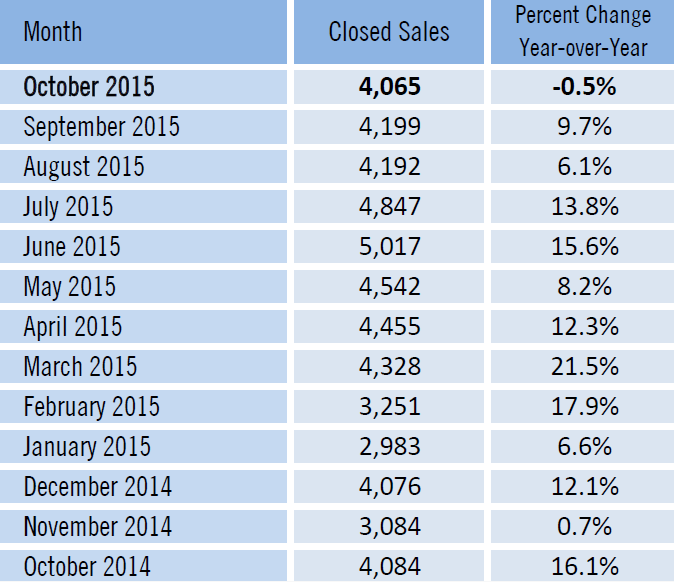 As evidenced by the graph, October closings are down about 1,000 units sold than in June. With the slowdown in full effect, this is a great time for both buyers and sellers to make a deal before the end of the year! 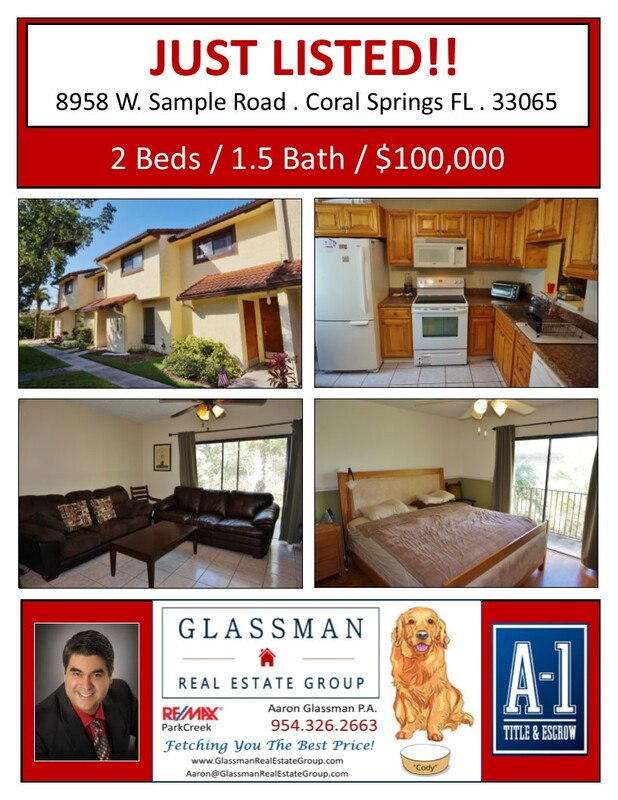 GLASSMAN REAL ESTATE GROUP - "Selling Real Estate in Parkland and Beyond! When I sell Real Estate in Parkland, or anywhere else for that matter, I give my all on every deal. As a Realtor in Parkland and throughout the South Florida area, I pride myself on the high level of personal service I provide. I've never been about the quick buck. For me it's always been the long term relationship that matters most! Disclaimer . Due to the unique events that occurred today, in my life, and in Paris, the blog below is more personal in nature than market related. See previous posts below for more information on Parkland real estate, as well as the latest news, charts and graphs. Well it was almost one of those days. My daughter woke up sick, my lunch appointment cancelled and then my listing appointment canceled. I drove from Parkland to Aventura, back up to Boynton Beach and then back down to Parkland. Like I said it was almost one of those days. But I was determined to make it count, even if it was Friday the 13th and the chips were stacked against me. It turned out that my wife ended up taking my sick daughter to my mother-in-laws. I made a new lunch appointment with an old friend, and while driving back up to Boynton, instead of listening to the radio, I made use of my time as wisely as I could and called my other old friends and past clients. It turned out to be a pretty good day. Strenuous, but one that I made great! I know it's cliché but, like life, Real Estate in Parkland and just about anywhere else is 10 percent what happens to you and 90 percent how you react to it. One of my favorite commercials is the one for Xbox that has a voice over of Sylvester Stallone that goes something like this: Let me tell you something you already know. Nothing hits harder than life, but it don't matter how hard you get hit. What matters is how hard you can get hit, and get back up, because that's how winning is done! Life can hit pretty hard, especially for people who never asked to be hit. It hit hard today in France pretty badly. All of my thoughts and prayers go out to those people who were hit extremely hard today. 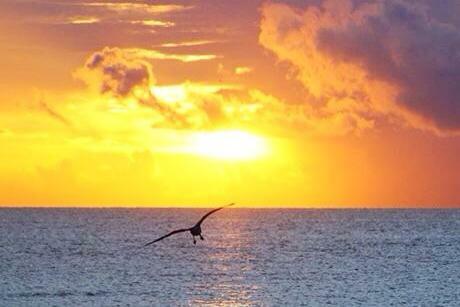 May you find away to react valiantly and may you find a way to win! Up, up and away! The snow bird season has taken flight!! Already two customers looking to either buy and or sell this season. My good friend and fellow broker Jason Quero of J. Michael Luxury Group also confirms that his action is heating up in the East Boca and Delray Beach Area. Are you in the market for a winter Shangri-a? Or perhaps you may be looking to list your beachfront condo for sale in Boca Raton, or your oceanfront mansion in Fort Lauderdale. Whether you are buying a new home in Hollywood, FL, or listing your home for sale in Delray Beach, FL we are able to help you with your real estate needs throughout South Florida. That's why one of our taglines is, "Serving all four corners of all three counties!" And yes if you read further on down at some of my other posts, you'll see a couple of our other taglines. The reason why we have several is because at Glassman Real Estate Group each tagline defines the unique differences that help set us apart from our competition. One of those differences is that we can service your real estate needs in all three counties. We have offices in Parkland, Aventura, Boca Raton, Weston, Miami, Boca Raton, Boynton Beach, and Lighthouse Point. We are not just your typical Realtor, who farms and services one or two communities. No, in fact we are not JUST anything. Rather we are a team of real estate professionals who help manage and facilitate real estate transactions from start to finish. We are not JUST Realtors in Parkland and beyond (another tagline) we are Realtors and a title/closing company, complete with an in-house real estate attorney. And as a native of South Florida, I have the local knowledge and experience that not just any other Realtor has. That I can assure you! GLASSMAN REAL ESTATE GROUP - "Serving all four corners of all three counties!" 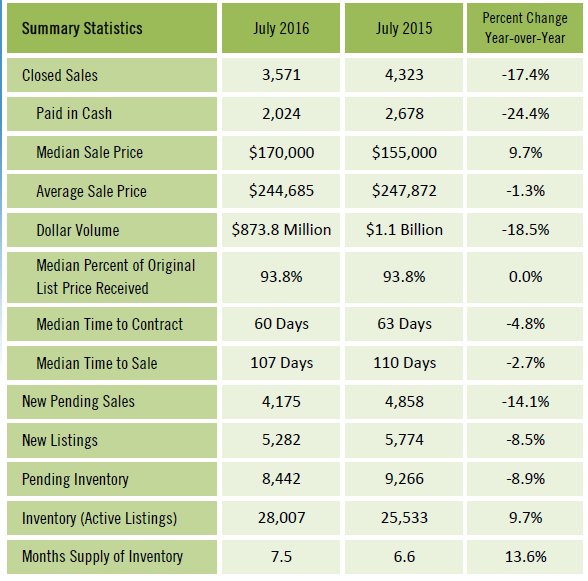 After peaking in February of 2015, it looks like the inventory in South Florida is on the decline. It would not surprise me, however, if we see a rise after the holidays and past the new year. For now, title closings for November are higher than anticipated, as it was very noticeable the last couple of months that the summer selling season was over, as closings in September and October were way down compared the six previous months. The big question is, what will rates be like next year and how will that effect property values and real estate for sale in Parkland and beyond? Glassman Real Estate Group . "Selling Real Estate in Parkland Florida and Beyond"
Have cash sales peaked? Here are a couple of interesting charts which indicate that the number of all cash transactions may be waning. What do you think? "Working Together To Serve You Better!" Love this 10 year chart indicating home values. This one happens to be for the city of Parkland, Florida. Looks like values dropped 50% after the marked crashed, before turning around. Does it look like values may be beginning to flatten out or is there still more room to run? Don't live in Parkland? Call, text or e-mail me and I will send you a chart of the city that your are interested in. Special thanks to Mario and Odalys Pardo for their beautiful testimonial and loyal support! Glassman Real Estate Group . "Working Together to Serve You Better!" The Numbers are in! Here is a quick snapshot of September's Monthly Market Summary for Single Family Homes located in Miami-Dade, Broward & Palm Beach counties. Looks like the number of closed sales and home prices are up! Meet Cody Ross! 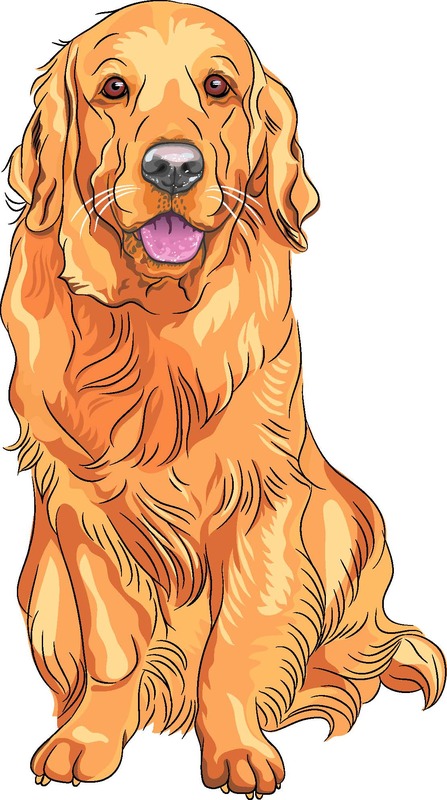 He's our mascot. We think that Cody embodies the Parkland lifestyle perfectly; family and friendliness. Cody also embodies another important characteristic, especially when hiring a Real Estate Company in Parkland, and that's protectiveness! And when you hire Glassman Real Estate Group to help you find a new home in Parkland or sell your house in the Parkland area, you hire a team of real estate experts who not only knows how to protect your best interests but also knows how to fetch you the best price! Or similarly said, Spring listings bring Summer closings! It's no secret that this is the beginning of real estate's busiest season, or at least most predictable. As sellers prepare their homes for sale, eager buyers hit the road with their respective Realtors for new homes by the beginning of the school year. Already nationwide we're seeing an increase in the amount of homes sold month over month and prices on the rise. In fact, closings at our title company, A1 Title & Escrow, have also steadily risen over the course of the year, with each month being better or equal to the one before. And, as long as rates remain under 4% or hover around there affordability will continue to be high. Well what does that mean? 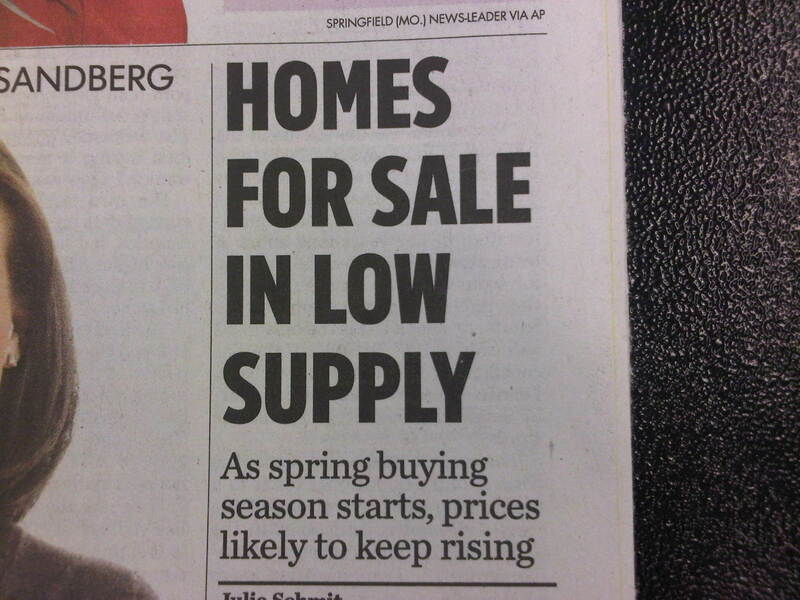 You would have to think the obvious, that prices will continue to rise as we move forward into summer. The demand for buyers to get into a new home before the school year will be too great for prices not to go up. My advice to buyers is simple, three things, strike while the iron is hot, put your best foot forward, and remember time is of the essence! My advice for sellers is even more simple, don't get in your own way. Successful investors buy low and then price to sell. This allows them to re-capitalize on their investment and move on to the next project. In this upcoming market, I believe that if it takes longer than 30 days to sell your house, it's overpriced! Also, seller's, if the price of your house is continuing to rise, then so is the price of the next house you choose to buy. Act quickly move swiftly and get to the closing table! Remember when it comes to the closing table and selecting a title company, then look no further than A-1 Title & Escrow and the Law Offices of Lisa I. Glassman, PA.
As Lisa always likes to say, "We'll' do your closing without giving you a hosing!" Please visit www.GlassmanRealEstateGroup.com for more information. Well we are already a month into 2015 and the market seems to be going along steadily. I recently posted the headline above on my facebook page, https://www.facebook.com/GlassmanRealEstateGroup and thought it was also good to post it here, too. In my opinion higher priced homes may be leveling off, and by higher priced I mean 700k - 1 million. There just seems to be a lot of inventory in this price range, but not as many buyers. Let's face it, how many of us have a million dollar budget? However, lower priced properties are still highly sought after and anything under 500k seems to be moving rather quickly and rising in value. Thanks to fellow Realtor Matt Swanson for this great chart regarding interest rates. For years now, long term mortgage rates have been at historic lows. Many have wondered when that would come to an end. Apparently it looks like it's going to happen next year. Now, can this be postponed again? Well, I guess anything is possible. Eventually, however, rates will rise, reducing the buyer purchase power. Hopefully it won't happen in a way that will cut current values drastically, but I do think that the rise of interest rates will have some effect on the mindset of the buyer and potentially the seller's bottom line. Well, I'm back! Took a bit of a hiatus to celebrate my mom's 75th birthday. Where to begin? So little to write about, and lots of time to write it...wait, strike that, reverse it. Lets start with this article from the Sun-Sentinel last week. It's really no surprise. After all, we are in the slowest time of the year. This is the time of year when demand slows down due to the holidays and the fact that we are way past the beginning of the school year. Inventory too has been on the rise as investor activity has dropped. In my opinion the market peaked last year in the spring/summer of 2013. At that time the market was in a mini refinance boom as rates dipped below 4%. Also traditional sales came back to life, and short sales and foreclosures were closing more often. Now as rates have risen (but still hovering around 4%), short sales dwindling, combined with the natural slow down of the market, the above caption is simply right on point. Of course there are still transactions taking place, just not at the same pace. Parkland real estate still seems to be a hot bed for activity, as are lower priced properties. The high stuff seems to be sitting around, and by high stuff I mean propertied listed from 750 - 1 million dollars. That's all the time I have for now, More to come...so stay tuned. 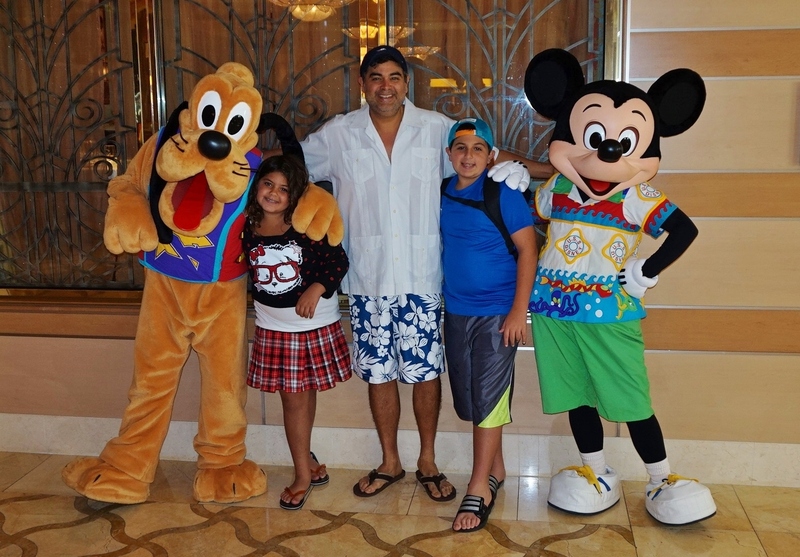 In the meantime, here's one of me and my kids from the cruise. Things have been busy to say the least. Should have my new video up in just about a day. 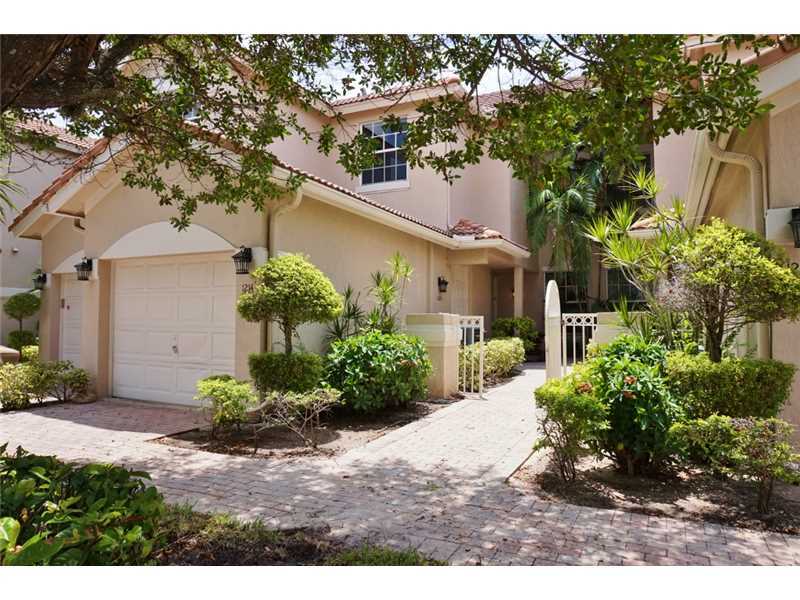 It's of my new listing in Coconut Creek. I have had nice action so far, with three showings already. 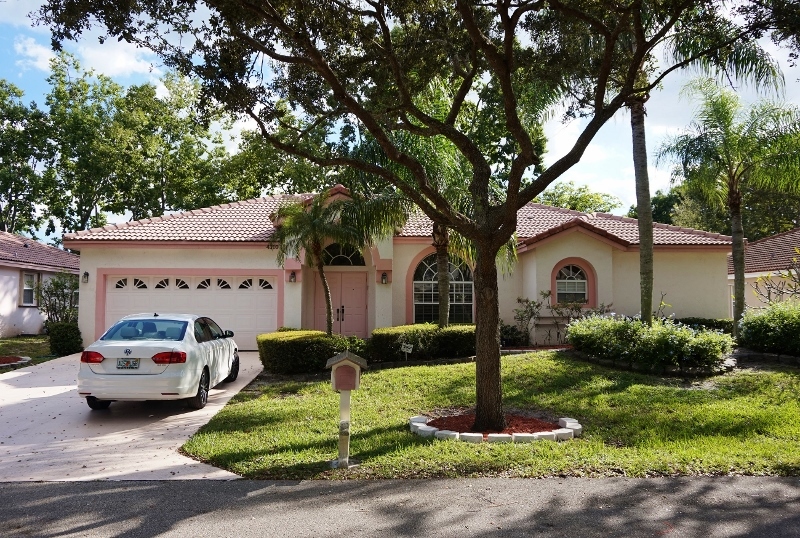 My listing in Cypresshead, in Parkland, FL has been steady with about one showing per week, as well. This week also included one appraisal for my waterfront condo in Pompano Beach, along with one BPO for my short sale in Pembroke Pines. Real Estate closings for the title company, A-1 Title & Escrow could always be busier, but still rather steady, even in our slowest season of the year. This is my last post until after Halloween. Stay safe and smart, and eat lots of chocolate! And remember if you are looking for a SWEET real estate team to take you from contract to closing, then look no further than Glassman Real Estate Group. Get all the treats and none of the tricks!! Happy Birthday Ma! Yep today is my mom's 75th birthday. Just thought I'd give her a shout out. She's rather beautiful and quite a fantastic woman!! Not too mention, I was out working today too. BPO this morning in Pembroke Pines and taking pictures and video to for my listing in Coconut Creek. Here's a few I added to the MLS. 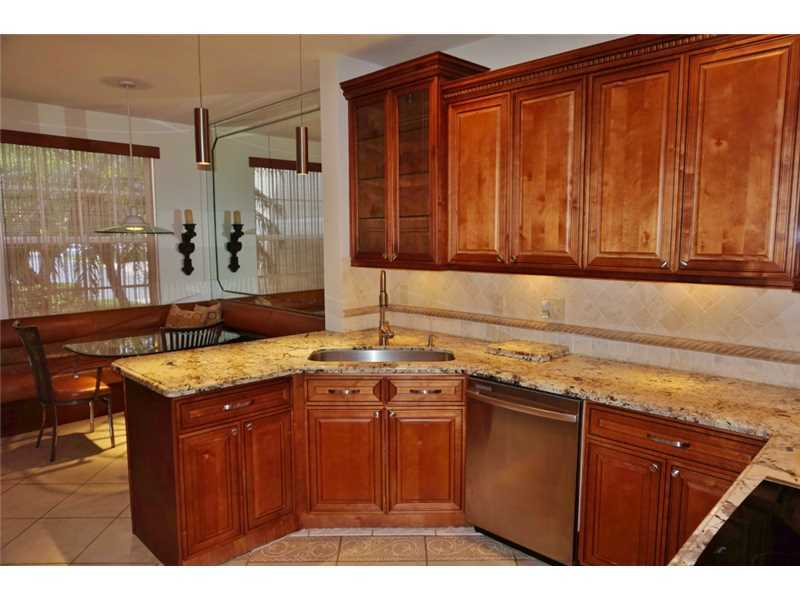 Click My Listings for more photos and information of this beautiful home for sale in Coconut Creek. 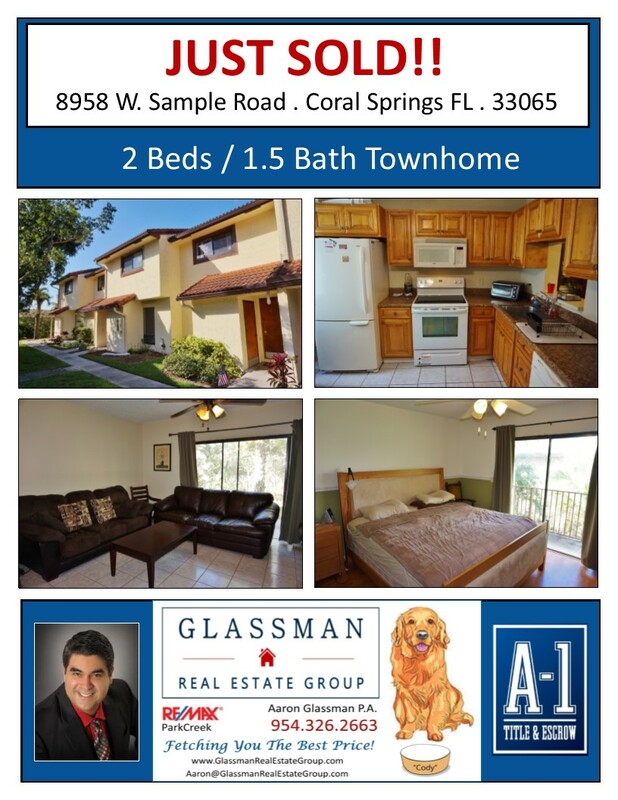 Even though I live in Parkland, I have listings throughout the South Florida area. So whether you are buying or selling a home in Parkland, or looking to invest in real estate in the surrounding areas, my team and I cover all four corners of all three counties! Amazing, we're in the slow season of real estate and things are picking up. Generally after the summer ends, the real estate market typically slows down. And while the title company has seen a decrease in closings over the past two months, our real estate listings are up! Short sales are still out there, as evidenced by one of my listings, but while doing research for my new listing in Coconut Creek, the majority of active and closed sales are traditional deals. Foreclosures are on the market, too, but the shadow inventory that everyone was afraid of flooding the market failed to materialize. The banks continue to trickle them out, creating bidding wars and rising values. Overall though, the number of distressed properties has decreased significantly, as evidenced by the chart below. Are you looking for a Realtor who knows the market and can give you educated guidance? Then call me! I am happy to discuss any of the this information and guide you through your next real estate transaction. When buying a home, there are several steps you should take before looking at houses. Most importantly you should speak with a lender first and get pre-approved. There is nothing more frustrating then finding a new home you love but only to come to find out after you are not qualified to buy it. Besides, most sellers want to know that a buyer is pre-qualified when they receive an offer I simply put it like this; does Steven Spielberg make a movie without doing his pre-production first? Think of getting pre-approved as doing your pre-production. There are many steps to buying house, and step 1 is getting pre-approved, iff not just to have your ducks in a row before you see a listing. This way you are able to strike while the iron is hot! Whether you are buying a home or selling your house, Glassman Real Estate Group provides comprehensive real estate services all under one roof. 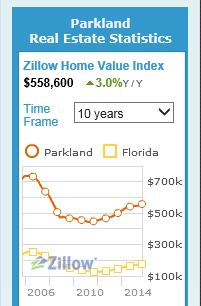 Here's a nice chart indicating that prices have rebounded in Parkland, FL and Coral Springs, FL. We're still not near the top of the market when it crashed, which to me means that prices have some more room to climb. Whether you are buying a new home or selling your house, my team can list and close your property under one roof. Live in one of Parkland's finest communities, Cypresshead. Lots of space & room to run! 5 bedrooms w/additional office/den that can be converted to use as a 6th bedroom. Updated kitchen, baths & laundry room w/ lots of storage. Live-In/Nanny quarters, Wet Bar, Double Wall Oven, Fireplace, 3 Car Garage. Screened in pool w/ spa & waterfall. The list just goes on and on! Community offers tennis lessons and summer camp. Updated clubhouse, pool area for parties, and a dock for fishing. Why live anywhere else!? 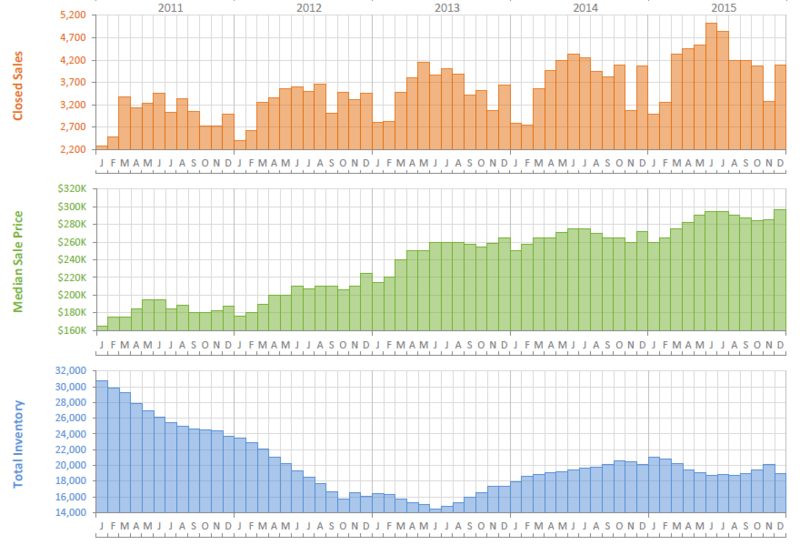 Overall, the South Florida real estate market looks to be very healthy. Prices have rebounded nicely off their lows and activity has been way up. The increase of prices has also kept some investors away, allowing for first time homebuyers to get in the market. I guess the big question is, what will slow the recent price growth? My answer always has been rates. The higher the rate, the less house someone can afford, which eventually will have a direct reflection on home prices and values. A quick mention about Short Sales and foreclosures. Love ‘em or hate’ em they are still around, and a piece of the overall real estate market. Their dominance, however, has abated and the table has now turned. Where there were once 2-3 traditional sales for every 7-8 short sales, there is now 2-3 short sales/REO’s to every 7-8 traditional sales. It’s a big difference from not that long ago. Unfortunately for those who waited until 2014 to do short sale now face a tax penalty for the 1099 they will receive for any forgiven debt the bank waives. Short Sellers should know that the Mortgage Forgiveness Debt Relief Act expired at the end of 2013, and has not been renewed. This Act was signed into law by President Bush as he was leaving office, and was already extended once. The Act forgave the tax penalty on any short sale that was a primary resident, as the forgiveness of the debt counts as income and is a taxable event. Through, however, the magic of an accountant, a seller would be able to write off the income. Here are some links to a couple of articles about the law and its expiration. No one really knows if the government will re-enact the law and make it retro-active for 2014. Time and perhaps the mid-term election will only tell. Just think of the law as an incentive that has now expired, and may very well not come back. 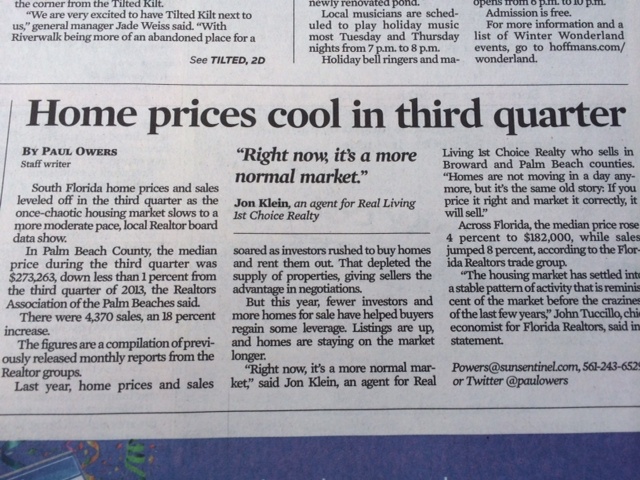 At the end of the day, the real estate market has certainly gotten better down here in South Florida. We are way past the bottom of the market. Traditional sales are up while distressed properties have slowed, (but still remain a part of the South Florida landscape). It looks, too, as if lending practices have eased a bit, giving more people a chance to own a home. Home values have risen but not to the levels of the boom years from between 2004-2008. Hopefully there is still some more gas in the tank to help keep values rising a bit more before we stabilize, or dare I say...retreat. If you like what you’ve read or have any comments and/or suggestions, then please let me know. I welcome your feedback at Aaron@GlassmanRealEstateGroup.com. Be sure to ask about our in house title company, too. By visiting my facebook site you'll be able to scroll through past posts, post your own comments and be able to better interact with me directly. The market seems to be on fire, once again. My guess is that January numbers will be up from the previous month and probably just about equal, year over year. While working with a buyer this last month, I have seen first hand what the market is doing. And being the proud owner of A-1 Title & Escrow, I will tell you that we saw a nice spike in the amount of closings for the last week of January. The buyers have hit the ground running in January after a long hiatus, including time off for the holidays. While out with my buyer, we experienced all of the same stuff you've probably already read about. So it seems we are off to a running start. Its was a sure sign that people are buying and selling properties with a sense of normalization to the market. More traditional sales are out there to pick from. But beware, my buyer and I still saw our share of tricky deals. Bank Owned REO's, Seller's making it difficult and flexing their muscle, and watch out for the corporate owned foreclosure. These are sales in which a corporate investment entity purchases a foreclosure at auction (usually) and then resells it as a flip. Usually the buyer must agree to a wordy addendum, sometimes picked up from a previous purchase. I happen to know a good one, my wife, Lisa Glassman of course. Thanks so much for reading, and if you haven't already, please click the link and like our facebook page. It's an easy place to stay informed and communicate with me, Aaron Glassman, Glassman Real Estate Group, RE/MAX ParkCreek. Thanks so much for reading, and one last question. Who do you know that is looking to buy or sell real estate right now? We'd be happy to help that person. Please give them our number and we won't let you down. Closings been slowing down the last couple of months. Lots to do with interest rates and all the refinances drying up. Not too mention that this is a typically slow period for real estate in general, especially since the back to school rush is way behind us. An agent in my RE/MAX office says that her listings are sitting longer on the market. Even though inventory has come down, it may now be a great time for buyers and sellers looking to make a deal and close by the end of the year. There, however, are still buyers willing to pay over the list price just to get their contract accepted, and if they simply "Must have" that house. Hopefully we'll have a strong end of the year, now that snow bird season is upon us. After all, what comes down must go up. Well, what can I say, it was a crazy summer! We have not seen business like this in at least seven years. Our title company almost doubled the amount of closings from the previous year. The market is back and with a very loud, voracious ROAR! One of the most important changes I saw was how many traditional sales there were vs. distressed sales. The market has indeed been recovering, as normal sales are outpacing shorts sales and REO’s at least four to one! In some cases even more. Don’t get me wrong, there are still short sales out there, but what’s left are the laggards. It seems as if the bulk and rush of the short sale process is behind us, with the rest straggling behind. Of course, there is still an immense amount of bank owned property still waiting to hit the market, but I do believe those properties trickle out rather than flood the market all at once. Besides, even if the banks dump all of their properties at once, the market is so filled with buyers that the newly released inventory will be soaked up like a sponge. Let there be no mistake, though. As mortgage rates rise, it will directly correlate to less affordability. Eventually, home buyers will not be able to afford the higher prices. Home prices will then stabilize, but not until rates are at a high enough percentage which makes mortgage payments too expensive. I’m not exactly sure what that percentage is, it just depends on how much people make and what they can afford per month. The market will end up determining that over time. Overall, I think we are at a precipice for change in the market. Will home prices continue to rise? Well, that just depends on interest rates and inventory. Right now rates are still historically very low and current months of inventory is at about 3.5 months. The ball is still in the seller’s court. Once we’re back up to, say, 6% APR and 6 months of inventory, we’re looking at deuce. I just wonder how much longer those rates will stay low. Working in real estate together since 2002, my wife and I have been part of the markets rise and fall, and now recovery. Why is any of this important, you ask? Well, because, with our daily interaction of contracts and closings, you get a local and honest perspective regarding today’s real estate market. Today’s market is extremely busy. It seems like everyone is looking to get in, (or out) while interest rates are still low and before prices get too high. We have seen a shift from a Buyer’s market back to a Seller’s Market. I once heard that you’ll know we are past the bottom, not when the cranes come down, but rather when they go back up. Take a close look around and you will see new developments popping up all around us. Lately, home values have gone up, as low inventory and high demand have created multiple bidding wars. We’re seeing it, too, in our title company. Traditional sales are starting to out number the short sales and foreclosures that have plagued the market for the past five years. Of course, a lot will depend on interest rates, but at historically low levels, affordability should remain high. Be sure to click on the link to in the column on the right for more stats snd charts. Although this is not news to me (see below), it's still a great indicator that it's a Seller's market out there right now. The inventory of homes is very low and buyer's are facing fierce competition, often being asked to place a highest and best offer. I know that where I live, in Parkland, FL, good properties are hard to come by, especially in Heron Bay. Working with several buyers and sellers recently has really allowed me to see some important changes in the market. First and foremost are bidding wars. I not only was personally involved in one on the lower end of the market (140k), but I had a buyer recently lost a deal worth 580k. My buyers ended up losing out to an ALL CASH buyer! On the Short Sale front things are getting strange, There still seems to be no ryhme or reason to investor guidlines. Some of my short sale listings last year flew right through, while others are still ongoing. The most important change I've noticed is that banks want full market value for short sales. It seems that the discounts that buyers used to get are no longer available. Lastly, word is that the dubious "Shadow Inventory" may be close to hitting the market. An attorney friend of mine who works for the banks says that it's only a matter of time before the foreclosures that have been caught up in the legal system start flooding the market. Now, I still have my reservations about this, as flooding the market may bring values down, but another part of me says that with so much demand and very little inventory, there will still be enough buyers to keep values steady. A lot depends on rates. If mortgae rise, then buyers wont be able to afford as much. This may put a damper on prices. It also may bring out more buyers, as they rush in to buy before rates get too out of hand, and they get pushed out of the market. ONE LAST THOUGHT: Can you say Bubble?